Don’t be fooled by its size — this little studio is loaded! The MTR (Multi-Track Recorder) mode offers 64 V-Tracks with eight simultaneous playback tracks. In addition, a dedicated stereo rhythm track is provided, as well as an onboard library of great grooves to choose from. The intuitive user-interface continues the simple-to-use tradition of BOSS’ acclaimed BR series, with a graphical design that follows the layout of a conventional recording console. With EQ, reverb, and mastering tools plus, world-class COSM amps and effects for guitar, bass, and vocals the MICRO BR BR-80 is ready to deliver complete, pro-quality recordings with ease. The MICRO BR BR-80’s eBand mode offers musicians a fun way to play along with their favorite songs. With the bundled eBand Song List Editor software, you can import CD, MP3, and WAV audio files from a computer via USB. The Center Cancel function can be used to minimize the volume of pre-recorded vocals and solos for play- and sing-along enjoyment. eBand mode is also an excellent partner for musical training, as it lets you record your performance adjust playback speed and/or pitch as desired. In combination with the onboard high-grade stereo condenser microphones, the MICRO BR BR-80’s Live Rec mode lets you capture pristine stereo recordings instantly. Record vocals, guitar parts, and song ideas the moment inspiration strikes. Your recorded audio files can be easily imported into the MICRO BR BR-80’s MTR mode to use as a basis for multi-track song production. The MICRO BR BR-80 is packed with professional multi-effects powered by a newly developed custom DSP chip. Over 40 types of COSM amp models give you instant access to a wide range of powerful guitar and bass sounds. The preset patches allow first-timers and pros alike to enjoy high-quality sounds immediately, while power users can tweak parameters in micro detail for the ultimate tonal control. The dedicated vocal effects, comparable with BOSS’s popular VE-20, include doubling, harmony effects, pitch correction, and more. 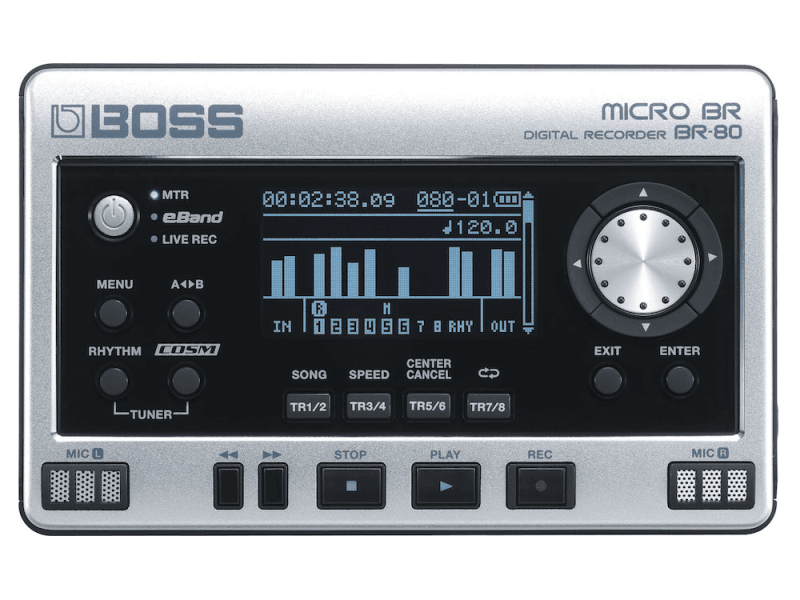 The ultra-flexible MICRO BR BR-80 can be used as a stand-alone digital recorder or as audio interface for a USB-equipped computer. Furthermore, the bundled Wave Converter software lets you easily exchange data between the MICRO BR BR-80 and any other DAW. LIVE REC Mode - WAV 16-bit, stereo: 1.5 hours (1 GB), 50 hours (32 GB), MP3 128 kbps, stereo: 16 hours (1 GB), 550 hours (32 GB) * The above-listed recording times are approximate. Times may be slightly shorter depending on the number of songs that were created. * The above number of the MTR mode is the total for all the tracks that are used. If each of the eight tracks contain an equal amount of data, the length of the resulting song will be approximately 1/8 of the above. Expected battery life - Approximately 6 hours (Alkaline dry cell batteries/with continuous playback of 8 tracks, power save function), * May vary according to usage conditions, batteries used, and type of SD card used. Weight - 140 g, 0 lbs. 5 oz. GracenoteGracenote® is a registered trademark of Gracenote, Inc. The Gracenote logo and logotype, and the "Powered by Gracenote" logo are trademarks of Gracenote. VSTVST is a trademark and software of Steinberg Media Technologies GmbH. TASCAM's DR-05 puts premium recording quality in the palm of your hand. Up to 96kHz/24-bit Broadcast WAV film recording provides better than CD quality to capture every detail. Record WAV or MP3 files to the included 2GB microSD Card, or expand with your own microSD & SDHC media. Like all TASCAM products, the DR-05 is simple to use with functions like two-button record and the Quick Menu for fast setting changes. Built into the DR-05 are a pair of omnidirectional condenser microphones. These stereo microphones are tailored for natural ambient recording, with rich bass response and lower handling noise than most handheld recorders. The built-in microphones capture a wide, natural frequency range suitable for any type of voice, nature or musical recording. A 1/8" microphone input is also available for adding your own stereo microphone or recording a line-level source. 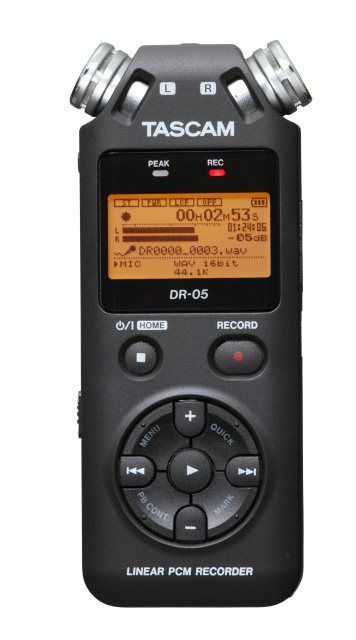 Like most TASCAM handheld recorders, the DR-05 includes playback modes to loop a section of playback or slow it down without changing the pitch, perfect for learning new music. A built-in speaker is included for checking recording without headphones. The Level Align feature smooths out level jumps during playback to help you monitor your raw, unmastered recordings. Other handy additions include a chromatic tuner and tripod stand mount. Though the DR-05 has everything you need to start recording – including AA batteries and a micro2GB SD Card – a host of available accessories make recording in the field even easier.